So soft and plush, you’ll never guess it’s made from cotton and latex. This dreamy combination is perfect for sleepers who want a firm core, with plenty of cushion to sink into on the outside. With a 3” natural latex core sandwiched between a soft, fluffy organic cotton core, this mattress is everything you wish a natural mattress could be. In sizes from crib to California King — and in custom sizes, too — these all natural mattresses offer an organic and hypoallergenic alternative in every size. Where cotton goes to get its degree, GOTS-certified organic cotton is held to the highest standards for health and sustainability. The core of our Pure Cotton & Latex Core Mattresses are made of endless fluffy layers of 100% pesticide-free organic cotton raised sustainably, from our farms to your bed. 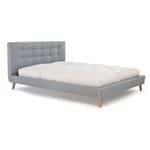 The Pure Cotton and Latex Mattress is one without springs, and as such won’t transfer motion between sleepers. We recommend putting it on a box spring set or platform bed, or even using it as a floor bed. A slatted bed frame is recommended for air circulation and the slats should be at least 2.5" wide and no more than 2" apart from each other. When the slats are more than 2" apart, that may affect the longevity and comfort of your mattress. Soft yet supportive, our Pure Cotton and Latex mattress is unlike any you’ve ever slept on, and we know you’re going to love it. The mattress and topper are a bit more dense than a traditional mattress, so you do melt into it a little but not a crazy amount and there is no bounciness like with a spring mattress- so it feels soft and I feel supported, which is exactly what I was looking for. What exactly is the wording for a doctors prescription? What is the expected lifespan of this mattress with daily use? Will it work well on a slatted frame? 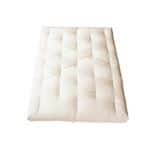 Thank you for your interest in our Organic Cotton & Wool Latex Core Dreamton Mattress. Depending on the spacing of the slats, you can use any White Lotus Home mattress on a slatted frame this actually helps the mattress receive proper ventilation, and that's how we showcase our models.